The interstate system includes the safest roads in America. In fact, since construction of interstate highways began in 1956, automobile fatality rates have declined 76%, from 60.5 fatalities per billion vehicle miles (F-BVM) to 14.5 (F-BVM). In a 1996 analysis for the American Highway Users Alliance (“40 Years of the U.S. Interstate Highway System”), Wendell Cox & Jean Love estimate interstate highways have saved 187,000 lives over a 40-year period. That’s nearly 13 lives every single day for 4 decades! Approximately 34,000 people are killed annually on U.S. highways, with 15,000 of those traffic fatalities in crashes where substandard road conditions, obsolete designs, or roadside hazards were a factor. (Source: USDOT). 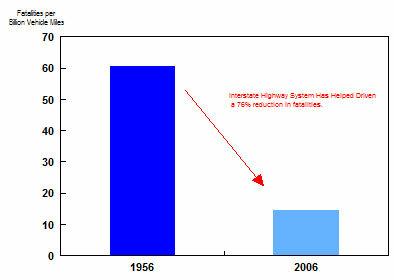 The fatality rate for interstate highways is nearly 60 percent lower that of the rest of the system. The injury rate for interstate highways is more than 70 percent lower that of the rest of the system. During the peak of tourist season, the Grand Strand population swells to 750,000+ people. Most of the visitors that travel to the Grand Strand drive their own automobile. Travel times during the main thoroughfares of Highway 501 and Highway 9 can become very congested during peak travel times. Interstate 73 will provide an alternative hurricane evacuation route. During a major hurricane, I-73 will save lives and enable residents and visitors to evacuate from pending danger more quickly and efficiently.